February 2nd was a night to remember for the MTA Varsity Lions basketball team and their fans. 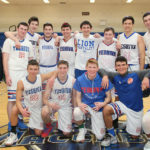 As the final home game for both the Seniors and Coach Wiesel, the night began with a ceremony honoring the Seniors for their devotion to their coaches and teammates over the past two seasons, followed by a well-deserved thank you to Coach Wiesel, who has coached the Varsity Lions for the past 14 seasons. The Lions did not disappoint in their last regular season home game and displayed both their skills and their desire to win against the YDE Thunder.